We have puppies! 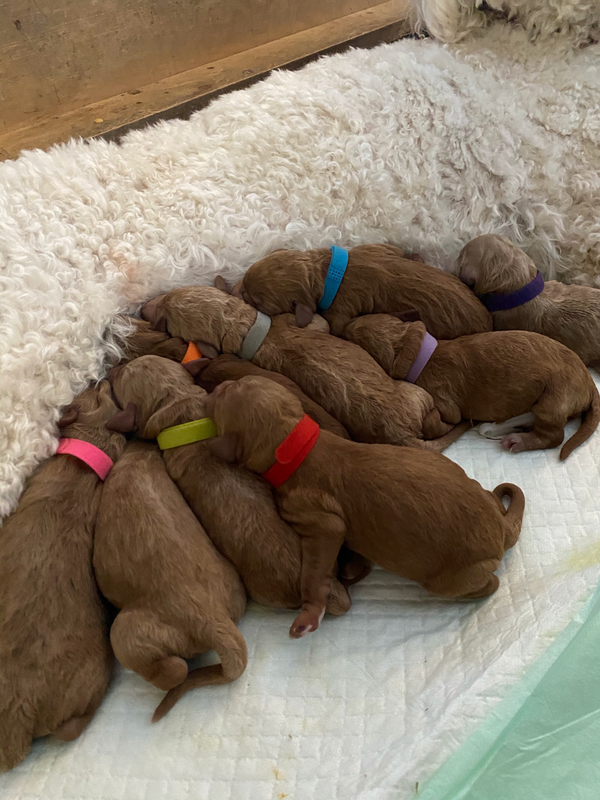 Mini-Goldendoodles born mid-February will be ready to go in April 2019. Reserve your Puppy today with $500 deposit. Mini-Goldendoodles are $2500 each. 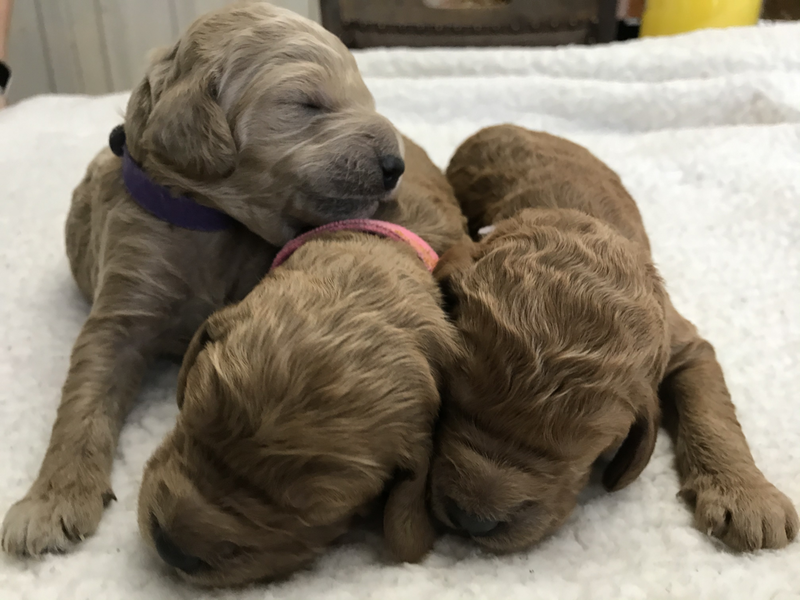 Adirondack Standard-size Labradoodles and Goldendoodles (50-70 lbs) are $2000 each! Go to payment page to send a deposit and reserve your puppy immediately! Many are already reserved and the slots don’t last long. If you have questions please call Heather right away at 315-775-7650. She is happy to answer all your questions. Deposit is applied to total price and is non-refundable once your choice is confirmed after your puppy is born. More info on Payment and FAQ pages! Skye's previous litter! We have a new batch of chocolates, ready soon! 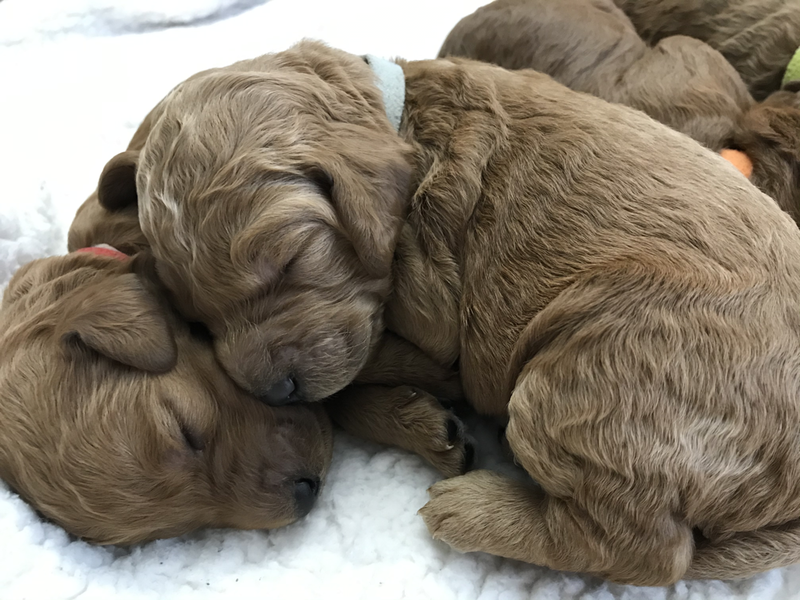 Head to the top of the page to see available Mini-Goldendoodles! That's it for the Fall 2012 litter- call Heather 315-775-7650 and reserve today! Winter litter 2012-all in their homes! Espresso-SOLD- Ridiculously cute curly black girl, smaller stature. New name-Tula! Basil- SOLD- Sweet little chocolate boy with curly fur. New name- Ruger! Ginger-SOLD- Blonde girl with Curly fur. New name- Addie! Very Curly coat! Super good- looking! Going to NC! Curly chocolate! Such a sweetie! I'm going to Kansas City! Dark chocolate and a chocolate nose! I'm headed for Pillar Point, NY! And turns out she's got a black nose--snazzy! I'm going to Buffalo! Go Bills! Black beauty! Headed for New Jersey! All the cuties & Mom- call to reserve! Here are some great pics of Chocolate Labradoodles out of Dolly and Chaco! They have all gone to their new homes now! We are leaving these photos here because we can't bear to delete them or find time to move them! Go to photos page to see them all grown up! Call today 315-775-7650 and ask for Heather, she loves to talk Labradoodles! He's the furriest! Super cutie, should have curly hair!